The declaration of fealty to Mr. Maduro was a setback for the Venezuelan opposition leader, who has been backed by several countries including the United States. None of these guys appears to be starving like the rest of country and even the troops they command. They have chosen the side of a despot who has kept the country on a course of ruin. Perhaps they are true believers in socialism despite its obvious failures. But one of the realities of socialism is that those at the top confiscate the wealth of the country for themselves. One of the few fat guys in Venezuela in the past scarfed downs empanadas in preparation for a speech. The slender guy is his challenger. 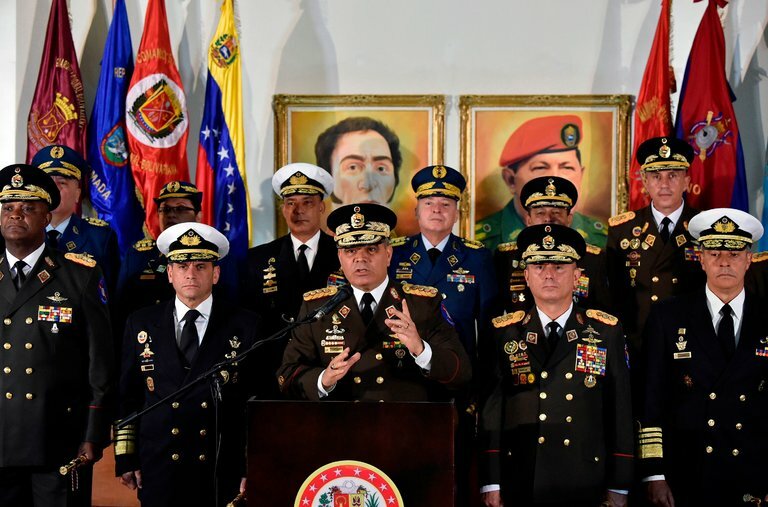 Some of the military officer pictured look like they are in a hostage photo.